Product Description:- The Aspire Perfusor Compact Syringe Pump for use on hospital wards, road ambulance, Air Ambulance and in the R & D Lab. 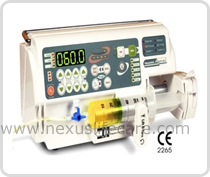 The unit is a small, light-weight, battery-operated infusion pump. The unit offers portability via mains or 3 AA battery operation. Simple Syringe exchange using either 10, 20 or 50ml Meastros Perfusor Syringes, the size of which is automatically recognised by the pump. High rate of precision & flow consistency. Aspire Syringe Pump is used for potent drug infusions where a very accurate rate of administration is critical, or for infants where only small volumes of drugs and fluids are required.